Hi guys, I need some advise. 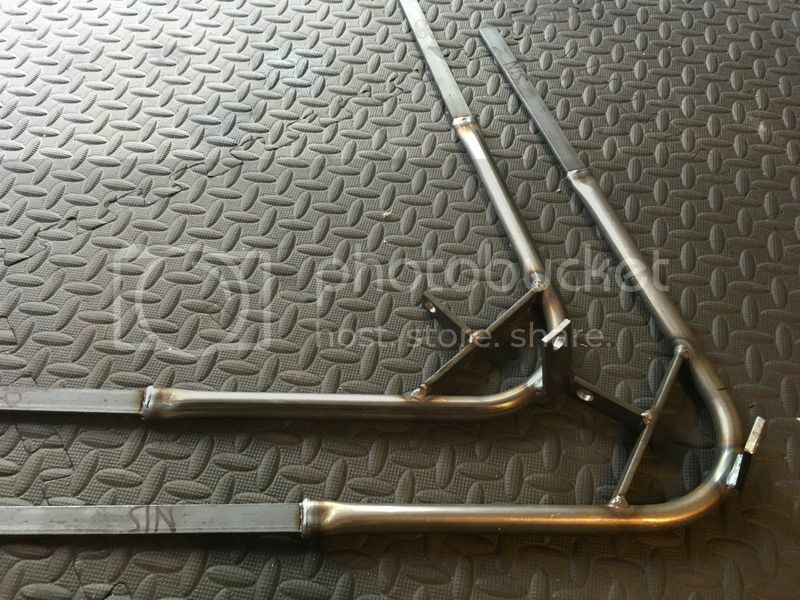 I have removed the clam shell wings off my car and got myself a set of GBS wing supports; all I need now is a pair of cycle wings. Having searched around online stores (MK, GBS etc) and dug through eBay it seems there is quite a lot of choice for what essentially looks the same, I would rather stay sub £100 so can someone recommend me a seller who makes good quality GRP wings in at least 210 width. Looks to be some skill there! Jaguar E-Type restoration work can certainly be difficult. I've helped my Dad work on several and simply getting panel curves and shut lines correct is not a simple task. Fitting and aligning the bonnet can be a real ball-ache to get right. Aother fan of the Dax Rush front cycle wings here - they always look good and seem to hug the front tyres pretty well. Depending on which uprights you are using you may want to check up on broken wing stays? I bought these ones for Sierra uprights, they seem pretty solid, is there a ‘normal’ failure point that needs strengthening before they get coated? I’m planning on using sikaflex to secure the wings. I’ve got the same ones and also not fitted yet, will be interested to hear if bonding on with silkaflex is sufficient? I’m going to drill holes in the flat section to increase the bonding edges (also with pre-drilled holes I can then just fit some large flange button cap bolts if it starts to fail) and then just keep my fingers crossed! Weak point is the welded joint between the flat bar and round section. The cycle wings vibrate and the joint fatigues, I have to get mine welded back up every 2,500 miles or so. I used sikaflex to start with, but switched to bolted on to make it easier to remove the wing when the bracket gives up and needs re-welding. It's a common problem with cycle wings. I've seen a post on here where someone made a support bracket that held the wing steady using the hub through the outer face of the wheel, very clever! I sikaflexed the wings on today, ran thick beads on both the wing and the bracket and mounted them, left them for the day then after 12 hours I applied a second coat to cover the bracket completely. Given the surface area of the bracket I am estimating approx 180kg of adhesion per wing which in theory is enough to lift the corner of the car by the wing! Nice, that will hold them on for sure. Removing them will be difficult, however. I ended up using a length of MIG wire about 2 ft long and wrapped each end round the middle of a wooden dowel, then used it like a "garrot" type flexible saw between the bracket and wing. That sliced through the sikaflex quite well, the wire snapped about 6 times but easy to make another one.